My family and I attended The Monster Jam show in Cleveland Ohio and all I can say is WOW!! Just when I think that the show can not get any better, it dose. This show was probably the best out of all the shows that we have attended. There were more stunts, more excitement and high energy. The coolest part of this year’s show is that the driver of ZOMBIE, Bari Mussawir, was born and raised in Cleveland! I must admit, I didn’t think that anyone could come close to Grave Digger but Zombie was really giving him a run for his money. 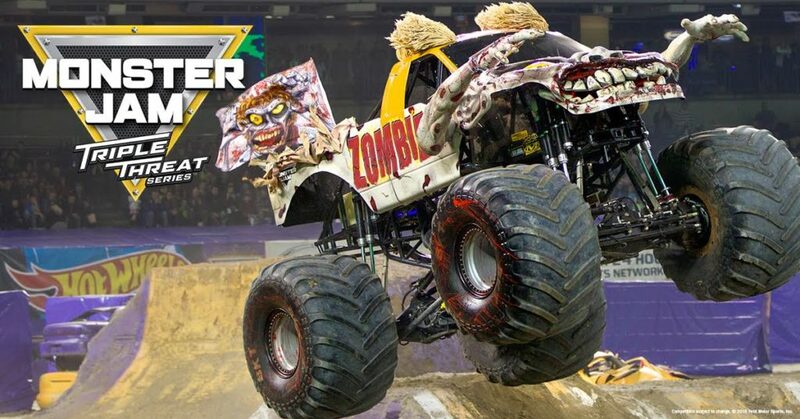 If you have never been to a Monster Jam show, you don’t want to miss this one. Quicken Loans Arena was packed with unstoppable action and unbelievable thrills. This show is a must see! My personal all time favorite is Grave Digger. He actually was the winner of the contest at the show that I attend and I was beyond excited. Once you attend a show, I’m sure that you will have your favorite. Check out this sneak peak and she just what you can expect from the show. Monster Jam Triple Threat Series Is A Must See and the best part is that you still have time to see the show. Monster Jam is partnering with the Cleveland Metropolitan School District (CMSD) and Radio One to give back to the northeast Ohio community leading up to their February 18-19, 2017 performances at Quicken Loans Arena. For each ticket sold to the Sunday, February 19th 6:30PM performance of Monster Jam, Feld Entertainment will donate $1.00 back to Shoes and Clothes for Kids. $5 off matinee performances with code MJ5 and $10 off evening performances with code MJ10! Not valid on premium seating. No double discounts. Valid online, by phone and at the box office. Kids tickets start at just $15.00 with a coupon from your local MetroPCS store.